Cutting pizza is always a messy affair, and it drags the toppings all over. 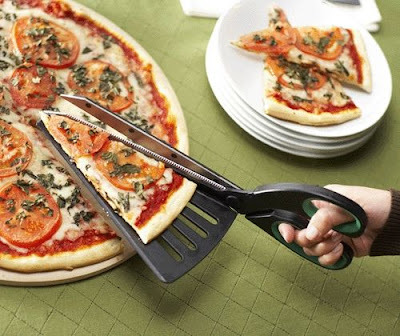 Thus I propose self cutting pizza. A proprietary and edible special cheese would be added to the pizza in the grid pattern of your choice. Special metarinka industries ltd "havoc Havarti" would be added during the pizza making process. After a set dwell time at oven temperature the cheese would start to break down until... BOOM! The cheese would be put into a shape charge such that most of the force would be directed downward. *disclaimer metarinka industries ltd is not responsible for exploded gas ovens, death or diarrhea. You would think that someone would have invented some sort of cookie cutter to do this with by now. I know I say this too much, but: det cord. Hey, it's better than my other fallback, the omnipurpose Claymore mine! Lethally dangerous, inappropriate and ill-considered use of explosives. Or fit the oven with a CO2 laser. Or fit the fridge with one. Or do what we do, and equip all the kitchen appliances with directed-energy weapons. Can openers, yes, but tea strainers? I'm guessing that 8th's diet consists largely of small, odd-shaped pieces of blackened & smoking carbon. It would explain much. You must be looking at his most recent x-rays, doctor. Those are actually not of his stomach, but of his very heart. Your complementary BorgCo gift is on its way to you, [rcarty]. I love pizza well cut, so a greasy + from me! I think you're safe, [rcarty]. This 'gift' would require [8th of 7] to be in relatively close proximity to a cat, which, we all know, is never going to happen. Au contraire, [neut]. It is only necessary to be in a location where a cat has been, and these are all too common. Further, it may be possible to obtain excreta from a dead cat by stamping on it. [rcarty] should beware the contents of his mailbox for a while yet. I'll be sure not to tear into any packages with my teeth. I'll be marking your package 'return-to-sender' and you'll be receiving back something much worse - aged and travelled cat droppings. is det cord a rare allergy? So it's an emo pizza then?